Sport Pilot Flying as it Ought to Be! Sport Pilot Flying as it ought to be. You pull the biplane out of the old barn, pull on your cloth helmet and goggles. The mags are on and with the pull of the prop the engine coughs to life, smoke dissipating as it smooths out its yawning start. You roll to the end of a long grass strip, shove the throttle forward and blur by the trees as you take to the skys for another glorious, timeless flight. If this is what you think of when you think of flying, you're at the right place. No ILS approach information here, just fun flying. Sport Pilot flying is a more affordable and more accessible way to get in the air. The new category created by the FAA allows you to fly with fewer hours, no medical and with almost the same freedom as a regular Private Pilot certificate. While the emphasis is on this catagory, we will be stepping outside of it at times to talk about other aircraft since the feel of this type of flying may sometimes carry over into other areas of flying. I myself, am a pilot of course. However, I'm not a 20,000 hour pilot, not a retired military pilot and never earned a living as a pilot. I do have quite a family history of flying and have nearly 1000 hours of flying just for fun. Thanks to my Dad, I get to fly a variety of aircraft. 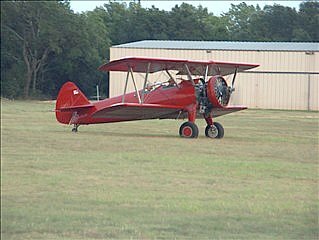 I have flown everything from ultralights to 450 Stearmans to RV8s. I fly simple aerobatics, love to do slips in an Aeronca and have a special place in my heart for open cockpit biplanes. A year and a half ago I decided I would get my Sport Pilot Instructor's Certificate for airplanes and have been teaching on the side. My goal is to help people who love to fly or think they might, get into the air. Everyone has a different opinion of what the perfect plane or type of flying is. There's no problem with someone flying ultralights and the next person flying $100,000 plus hotrods. Each has its own place and each pilot will find something that will fill their needs. Learning to fly can be a simple process and we will try to help you with that. Different methods, books, videos and other learning aids will be reviewed. There's lots of stuff out there that the everyday pilot can buy. Unfortunately, if you keep buying it all you won't have much left to go fly with so maybe we can help with your collection of flying paraphernalia. Sport Pilot aircraft fit a very specific set of rules put out by the FAA. There are some great aircraft out there and we will try to cover some of the pros and cons of each. And...you've got your Pilot Certificate, now what can you do with it. There's always a good place to fly nearby and some not so nearby. We'll give you some of our favorites and maybe you can share some of yours. Sport Pilot flying is the fun end of flying. Pilots, whether they are actual "Sport Pilots" or just in the sense of the word, all have a common goal...go out and have a good time in the air. I am a Sport Pilot Instructor and passionate about flying. How to get a Sport Pilot License, have fun and save money all at the same time! Hangar flying stories to keep you entertained. The Sport Pilot Stuff Blog keeps you up-to-date with all additions and changes to the SportPilotStuff.com Web site. Subscribe here.